For years we have been known as the Greater Rochester Jazz Orchestra (GRJO). However, we have now changed our name to the Syndicate Jazz Band in order to be more clearly associated with the Jazz Composers Syndicate. The Syndicate Jazz Band is a community inspired, large jazz ensemble founded in 1996 by Anthony Amoroso, a retired lawyer, and chiropractor Gary Kuhn. Together, their life-long love of jazz led them to found a big band in the style of the great Count Basie. Gary Kuhn retired from the band in 2010 and in 2011 Tom Pesciotta became music director of the ensemble. 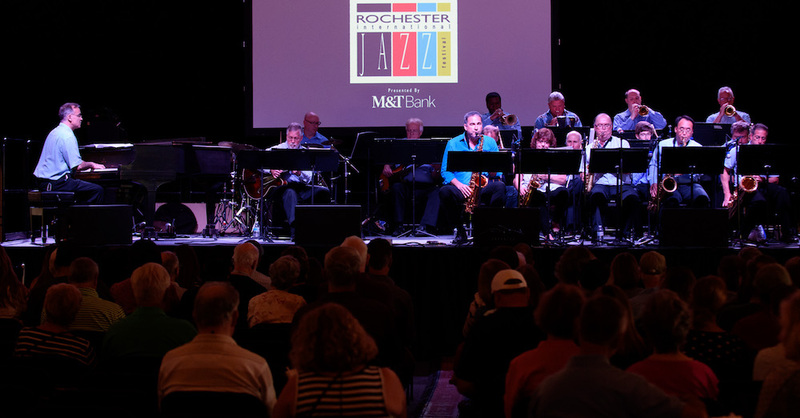 The band performs throughout Monroe County at summer concerts sponsored by local communities, area festivals, fund raisers, colleges, local schools, wine tastings, as well as an annual appearance at the Xerox Rochester International Jazz Festival. The band is comprised of Rochester area residents from a variety of professions and backgrounds who all have one thing in common—they love jazz. Once a week they meet to devote their time for rehearsal and camaraderie in their pursuit of the joy of music. These dedicated individuals freely give of their time in support of the musical arts and the promotion of America’s first—and truly original art form—JAZZ! Allow us to introduce you to our members. Simply choose an instrument from the drop-down menu above.